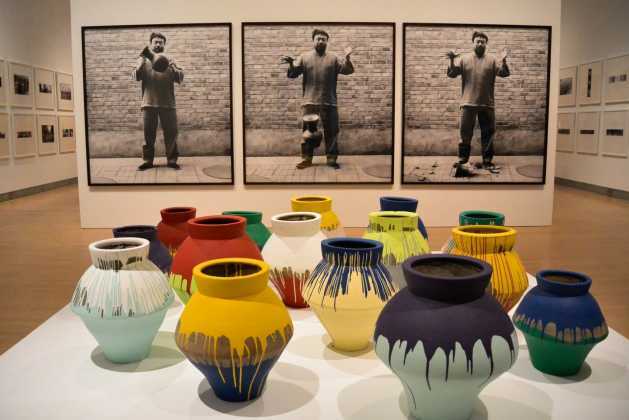 UNITED NATIONS, Apr 23 2014 (IPS) - Without authorisation to leave China for the US, artist and activist Ai Weiwei has opened the last leg of his touring North-American exhibition in New York. Although Ai was detained and his passport confiscated in China three years ago, his current Brooklyn exhibition “Ai Weiwei: According to What?” brings to life his experiences and beliefs – mostly through photography, sculptures, videos and art installations. During a video address to the press, Ai expressed his regret that he was unable to attend the exhibition. “I really hoped that I could be there with you and give necessary explanations of the work but for three years I’ve been secretly detained, put on bail and been in soft detention. My passport is not in my possession,” Ai said. In recent years the Chinese government has had an aggressive crackdown on activists, lawyers and campaigners who attempt to criticise the government. “This [crackdown] is deeply disturbing,” Sophie Richardson, the China director at Human Rights Watch, told IPS. “The government is trying to sustain an unrealistic balance between appearing to respond to certain kinds of public unhappiness on certain issues without feeding power into independent institutions nor are they tolerant of criticism,” she said. Richardson said the prosecutions are a result of convenient individual and organisational targets. Ai said his inability to attend also reflected the plight of other Chinese nationals in the same position. “Being not allowed to attend also reflects my condition and so many writers, poets and musicians in China who are in detention or jail,” he said. One of the installations entitled “S.A.C.R.E.D.” is one of Ai’s newest works and the first to be shown in North America. It was made as a response to Ai’s 81-day detention where he was held secret location. The dioramas were reproduced from his memory of his daily life during this period. Also on display is Ai’s room-sized piece “Straight” that although has been shown during the tour has doubled in size for the New York leg. The piece reflects the artist’s feelings towards the sub-standard materials used for housing and schools after the 2008 Sichuan earthquake killed over 69,000 people. The piece was originally produced from 38 tonnes of rebar from the collapsed buildings but for this exhibition the piece expanded to 73 tonnes. As a former resident of New York for 10 years, Ai said that this last leg of the tour was the most emotional for him. In March, Chinese lawyer and activist Cao Shunli died while in detention after not receiving medical attention. U.N. Secretary-General Ban Ki-moon expressed his deep concern that Cao was detained in relation to her work and U.N. human rights mechanisms. The exhibition “Ai Weiwei: According to What?” is running until 10 August at the Brooklyn Museum.